Netbooks are probably one of the hottest Christmas tech gifts this season. Jolicloud is a new operating system built especially for Netbooks. 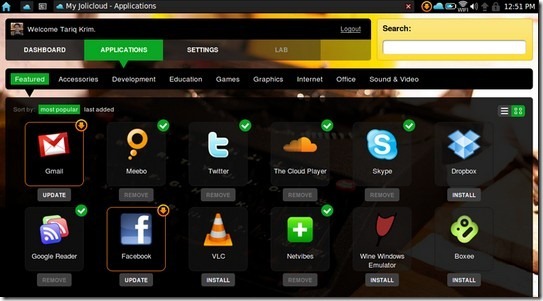 Jolicloud provides a beautiful interface with an application directory and a set of most popular social network features that makes it easy and fun to use your netbook. Jolicloud OS has been totally designed keeping screen real estate in mind – with everything being quite visual, making it easy to navigate. You can install a bunch of applications in just minutes and web based apps like Gmail, Twitter, Flickr, etc and also desktop based software such as Boxee, Skype, etc. You can also subscribe to other Jolicloud users and see the apps they are installing and using adding a little bit of social element to the OS. Think of Wakoopa brought to the netbook world. Jolicloud right now can be installed on a variety of Netbook hardware like Aspire One, Aus, Compaq, Dell, HP, Intel, Lenovo. MSI, Samsung, & Toshiba netbooks. Look here to see the full list of supported hardware. Jolicloud is right now in private beta and you could request an invite to give it a try. TechCrunch reports of the availability of Jolicloud Express – which will let you simply download the OS from Jolicloud website, install and run it alongside any Netbook OS you may be running – Windows XP or Windows 7.